When Suzanne Wechsler first stood outside Samish Bay Cheese as its new owner back in 1996, she had a vision of a welcoming homage to farming and hospitality. Twenty years later, that vision for Suzanne and husband Roger has become a reality with the opening of Samish Bay Cheese’s new retail shop and production facility. Located near the base of Blanchard Mountain in Bow, the Wechslers have been thinking about an expansion for several years. Planning began in earnest two years ago, spurred by the sight of lines of customers waiting outside the original 100-square-foot shop to taste and buy cheese. 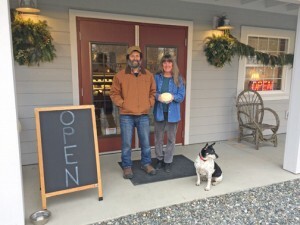 Self-described risk takers – neither of them had made cheese when they purchased Samish Bay – the couple knew they needed to expand and decided to take the leap. They’ll have plenty of space to do that now. The new 900-square-foot retail shop showcases Samish Bay’s products in deli cases. Customers can buy their organic, grass-fed beef and pork from hogs fed organic grain and whey from cheese making. 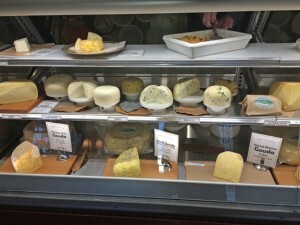 A long counter allows plenty of space to sample and buy their cheese as well as order from a menu that pairs the cheese with local products. Choices may include bread pudding (that Roger tops with Samish Bay yogurt) made with Breadfarm bread and Samish Bay milk and eggs, and Samish Bay’s labneh, strained yogurt topped with pickled blueberries from neighboring Bow Hill Blueberries and served with Breadfarm ciabatta. Local Fidalgo Bay coffee, Flying Bird Botanical tea, cider and wine are also available. The Wechslers are applying for a beer license. On chilly days, the glow of the fireplace and pendant lights encourage guests to linger at one tables in the shop. On a recent visit, Charley the Cheese Dog, the official farm greeter, set an example, sprawling on the rug in front of the cozy fireplace. Within sight of the retail shop is the new 3,000-square-foot production facility where they make and age more than 25 different kinds of cheese plus make and store yogurt, kefir and labneh. The expansion allowed for more equipment that supports food safety, quality and consistency, including a second vat, a draining table, mixer and monitoring equipment. The building includes two aging rooms, coolers, a brine room, office space and the production room with its large viewing window. Customers can stand outside on the patio to watch as the cheese is made. The Wechslers feel the improved working conditions are also an investment in their eight full-time employees. In addition to more space, the upgrades include an intercom between buildings to ease communication. To introduce customers to the expanded operation, local artist Mandy Turner created an illustrated self-guided tour that walks visitors through the 200-acre farm. Turner is among a long line of local talent the Wechslers hired for the project. Fisher Construction was the project contractor. James at the Lucky Dumpster in Edison sourced the barn wood that forms the shop counter. Woodworkers at Smith and Vallee in Edison built the cabinets. Banner Solar installed the 163-panel solar array on the roof of the production facility and barn. Shop lights are from Chuckanut Lighting in Burlington. And there’s a nod to Samish Bay’s history in the metal background of the gas fireplace – it’s from the roof of their original, tiny shop. Investing in the Bow location is a departure from their past. Farmers markets have been a central part of Samish Bay’s growth strategy. And while they’ll always have a presence at regional markets, their mission is to become a destination creamery. The Wechslers said the change is a lifestyle choice – less hours on the road managing market stands – and savvy timing – capitalizing on their location along the Bow-Edison Food Trail, as more customers making the drive to Bow and Edison, and surrounding areas. According to the Wechslers, the route goes something like this: a little something to eat at Tweets in Edison, followed by stops at Breadfarm and Slough Food for picnic supplies, a swing by Bow Hill for blueberries and Samish Bay for cheese, and then north on Chuckanut Drive to Taylor Shellfish for oysters and a picnic by the bay. The Wechslers’ later plans include picnics outside near the garden and a fire pit or stop for barbecue or live music. They may also add wine tasting and cooking demonstrations. Beginning with the Tulip Festival, they’ll serve ice cream made from their milk and co-branded with the Skagit Valley Food co-op from a walk-up window. Samish Bay Cheese is open seven days a week, Monday-Saturday, 10 a.m.-4 p.m. and Sunday noon-4 p.m. Hours will expand in March. Follow them on Facebook or join their email list for invitations to special events and updates, including the official grand opening of their expanded facility.